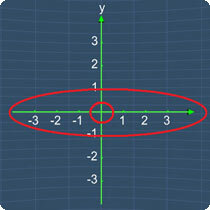 Name the two circled parts of the Coordinate Plane as shown in the picture. The other circled part is the point of Origin as shown in the picture. It is important to label this point as 'O' whenever you draw the Coordinate plane. From Step 1 & 2, clearly the answer for this question is B.